1. What is another name of Australia? 3. How do Australians call themselves? 4. What two animals are on Australian coat-of-arms? 5. When do Australians celebrate Christmas? 6. Which famous British discovered Australia for the British Empire? 7. 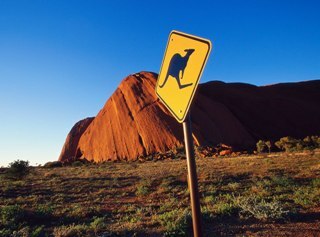 When do Australians celebrate Australia Day? 8. What is the Aboriginal name for famous Ayers Rock? 9. Which of these famous actors is Australian? 10. Which of these famous actresses is Australian? 13. What did the aboregene use the boomerang for? 14. Which are the hottest months in Australia? 15. Kangaroo carries its baby in a pouch. Which other Australian animal does the same?